Some spectators like to analyze the technical elements. Some like to just be open and drink it all in as an artistic experience. However you engage in a performance, there are so many layers available to explore. Here’s how to recognize effective and admirable elements as a spectator. Like a visit to the museum, spectating competitions is a different experience for each person in the room. You could get absorbed into the atmosphere and get pumped by the energy of the crowd like a hockey game. You could let go and allow yourself to get lost in the emotion of the moment, like a good movie. You could analyze the art form and appreciate the technical display, like figure skating. Swing Dancing is a rare fusion of art, sport, culture, and participation. Competitions and performances are a part of the culture of WCS, and events are designed to feature them as a celebration of the artistic, athletic hobby we love to participate in. It’s possible to attend so many conventions you get numb to the spectacle of competitions. This is a warning sign – time to take a step back and appreciate this amazing cultural pastime you fell in love with. Connect with the performers – be responsive – the performers feed off your energy. If you are sitting on the floor or in the front row or tables, those seats come with a responsibility: the performers can’t see much past you, so you are basically the representatives of the rest of the audience – the performers are looking to you, aiming their movements at you, looking to generate a response from you. Don’t leave them hanging: React to their gestures. Cheer at the stunts. Laugh with their comedy. Model spectating for more novice spectators. Be conscious of who is watching you – let Juniors observe you applauding everyone, not distracting others, and giving a standing ovation for an outstanding performance. And for Pete’s Sake, keep applauding until the competitors walk off the floor! Nothing is more depressing than walking off the stage in silence after an abbreviated applause. Once upon a time we were at a Country Western event that had a variety show, with a very mixed audience – half dancers, half public. We were performing Don’t Stop Me Now, which as you know is a lively, invigorating, crowd-rousing piece. Dancer friends told us later that as they were enjoying our routine and cheering after the big moments, they were scolded by the public spectators in front of them to pipe down. Don’t let uneducated audience members bully you out of the cultural norm of our sport. They are the strangers in the strange land: show them how to cheer on dance performances. Congratulate performers you see in passing -they can’t hear your comments during the show, but they all appreciate hearing qualitative feedback and acknowledgement about how their efforts affected you. Something that struck me very early in our career was random spectators who thanked us after Showcase: They felt gratitude for our risk-taking for the purpose of sharing our art. Some thanked us for pushing the envelope in difficulty or for making their favourite song come to life. By saying thank you (in addition to) “congratulations” or “good job”, the spectator is acknowledging the performance as a gift that we had to put a lot of work and vulnerability and sacrifice into in order to give. The topics may change, but the gesture of gratitude is one of the most primal and generous and yet least offered types of feedback. The best part is that “thank you” is more honest than “good job” or “it was great”, because it’s still valid and feels authentic even when (we felt) the performance was a flop. Timing, Technique, and Teamwork, right? LOL. Let’s not go there right now. You don’t need to judge or be a judge, but see what you can learn from observing other dancers of any level. Sometimes I get epiphanies just from watching the Newcomer J&J. Mix & Match (meaning the J&J contest is gender neutral): observe dancers in non-traditional roles and note what makes the good ones look good – sometimes this is more obvious than when they are dancing traditional roles. Watch for an improv partnership that appears as though they are sharing a brain. Observe the conversation like a tennis match: enjoy the banter. Imagine yourself being in the partnership: what would you have done differently? Appreciate “happy accidents”: mistakes that actually turned into something amazing! If you’re a DJ, notice how the certain dancers react to certain songs. Notice how the room energy changes. Watch for “dance accents” – see how WCS looks different in different regions. Appreciate the similarities – the fundamental elements we all have in common that are true to the character of WCS. Allow yourself to get inspired by different interpretations of the stylistic variables. Look for ideas to experiment with in your own dancing. Think like a student: study dancers in the divisions above you. Watch how they behave, how they dance differently with each partner, how they change their dance to suit each music genre. Notice behaviour patterns like use of starter steps, groove, footwork, and musicality. Try picking certain body sections and focusing exclusively on them, such as free arm styling or hip position during anchor and stretch. Disclaimer: This is not a complete list, and reading this list will not be enough for a competitor to learn about choreography. Each one of these topics has a deep well of technique needed that should be acquired from coaching. As an audience member, enjoy hunting for and recognizing these elements while spectating routines. Recognizable Swing patterns, rhythms, and footwork – duh. Subtlety: microscopic details in musicality: fingers, head tilt, eyebrows, flex foot, etc. Competitors enjoy getting pushed by their peers to develop fresh new choreography and tricks. The higher the difficulty, the higher the risk, the greater the potential payoff. Don’t be fooled by seemingly effortless tricks: every amazing trick involved significant bruising before making it to the competition floor. When you notice a high-difficulty trick being attempted, recognize and respect the attempt, even if it’s not perfect – these competitors are pushing the boundaries of our sport! Many lower lifts are higher risk/difficulty because of timing and speed. Whenever someone’s head flies at the floor, the risk is higher. Blind hand catches and floor work (knees, leg-unders, weight supports) are higher risk. Travelling spins (with multiple hand changes and leaders’ turns) and stationary spins/rides in transitioning or contorted positions, all get harder the longer they last. 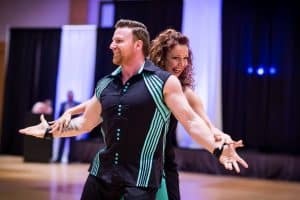 Some competitors like to include fun surprise elements that are more of an inside joke, breaking the 4th wall, a nod to pop culture, or a choreographic illusion. They are meant to make the general audience feel “in on the joke”, build anticipation, and to entertain the wiser observers – those who appreciate the details will feel more connected like they understand a secret code. An homage to some historical reference like including a classic old school or vintage move only works well if the move is done properly, in the right context, and gives a cheeky wink to its orgins, as opposed to blatant plagarism. In our Gatsby (2014) routine, we pretend to set up a trick where I would lift Myles, then turn to the audience with a smirk and a finger wag to show that I fooled them. Ben Morris is a fan of Easter eggs so fleeting, it’s easy to only discover them after several times seeing the performance. Gary and Susan in their 2017 Classic routine have an entire phrase that progresses across the floor, then perfectly reverses itself. All dancers draw inspiration from each other, and new stunts often open the door to a new trend of movement. In WCS, originality is more respected than replication. No one can really patent a move, but there are some moves that are so iconic it would seem strange to see done by another couple. There is an unwritten rule amongst competitors that we don’t use someone else’s trick in the same year they are competing with it, but it is open game to take a move and adapt it to put your own twist on it. We have several lifts and tricks we developed that we are known for (knee spin and pistol squat spin, the leg breaker, the skater press, etc). Every couple has their own brand and collection of moves they are experts at – audiences can count on them displaying the moves (or type of movement) they are known for in each routine. Sometimes the Champions borrow iconic moves from historical routines to add an Easter egg to their J&J. West Coast Swing does not have strict guidelines when it comes to costumes, so there is a wide spectrum of quality, style, and formality. I have written other articles on WCS competition fashion. Compared to Ballroom, rhinestones are more conservative and menswear is typically looser. For footwear, there are several options these days, so it can now be considered part of the costume design. Thoughtful competitors take time and effort to design their costumes to match their music and choreography, to suit their body types and personal style, and to make themselves more memorable to the judges and audience. As a spectator, look for theme elements and how they match the music: shredded fabric for a post-apocalypic rock song, neon for a dubstep or hip hop song, soft flowing layers for a lyrical song, etc. For Let’s Get It On (2012) we wanted to create the characters of a husband coming home from a long day at work to find his wife waiting for him in lingerie. The colour-changing gloves from our Fix You (2014) routine symbolically represented the theme of the song: trying in vain to help/change someone. Our Don’t Stop Me Now costume (2015), alluding to Freddie Mercury’s fetish wear, was balanced by the conservative full-length side panels that looked like a pantsuit. Cheap and cheesy moves get your attention, but don’t have much substance. Basics should be crafted, not just filler: appreciate good quality, well-executed basic steps and patterns when you see them. However you spectate, take a moment during every show to step back and appreciate this amazing arena of shared physical self-expression you were lucky enough to discover and get to actually participate in!